I took this photo at Hamilton Pool at a natural state park outside Houston, Texas. 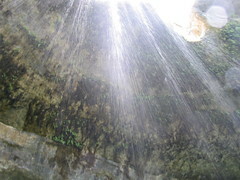 Amazingly, I took this with my digital camera while swimming underneath the waterfall. It was exhilirating! Previous post: Bookner.com: Matchmaking Service or Marketing Research?